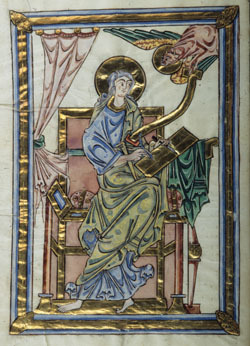 An example of an image touched with gold leaf from an illuminated manuscript. Image from http://ica.princeton.edu/conferences/2010march16-17.php. Hrothgar replies to Beowulf. He opens with an explanation of how and when he knew his father. and for our benefit have you sought us. son of Halfdane; he was better than I! It seems that Beowulf has proven himself to Hrothgar. Certainly not because he’s shown the Danish lord what he can do, but because his words have inspired him with belief. That’s my explanation for Hrothgar’s switching to a more plain speaking style, anyway. Throughout the entirety of his speech in this week’s extract, Hrothgar leaves out any sort of interlaced structure. He doesn’t start an idea before the caesura of one line and then end it on the opposite side of the next line’s mid-way pause. Considering that he’s just met Beowulf, and only just heard him speak, Hrothgar is also being quite open and forthwith. Certainly the thanes that he has around him would only faintly correct him when he says that his brother was a better man than he (l.469) at this point in the struggle with Grendel, but it’s still a strange thing to admit to a total stranger. One thing’s for sure, historical accuracy in regards to these men’s exchange takes a back seat here. Instead of having to go through several meetings to get to this level of candid speech, Hrothgar just immediately moves to it after hearing Beowulf’s pitch. And that is exactly what the main man’s speech was, a pitch. Epic poems can’t be all bluster and long-winded speeches after all, so rather than showing a series of meetings between the leaders where Beowulf and Hrothgar gradually build up a rapport and mutual trust (no doubt a decent way to turn this story into a modern novel), the poet just has Hrothgar accept Beowulf at his word. Oh – and at his father’s word, too. For, although Ecgtheow isn’t present, I think his having sworn oaths to Hrothgar (l.472) gives Beowulf some privileges within his estimation. From the sounds of it Ecgtheow caused Hrothgar some worry when he was just starting to rule over the Danes, but I think something important remains unsaid here. I think that Hrothgar’s being given the opportunity to solve the feud between Ecgtheow and the Wulfings is something that he used to secure his then new-found position as ruler of the Danes. On line 467 he describes the Danish people as consisting of “walled and treasure-filled towns of warriors” (“hordburh hæleþa”). These are a people who would probably not readily transition into having a new king. Any one who was fresh to the throne would likely have to prove himself worthy of it. Such proof would probably come in the form of a show of might, but I think part of why Hrothgar brings up Ecgtheow here is that he sees the man as having given him an alternative way of showing is aptitude. He’s given a diplomatic situation to solve, and he does so handily. Hrothgar sends the Wulfings what amounts to wergild – payment as recompence for a slaying – and gets the exile to swear oaths to him. Thus, the Wulfings are appeased and the threat that is Ecgtheow is neutralized. So on one hand, Hrothgar helped Ecgtheow when he was in a tight spot. Being exiled because you’ve killed a man with your bare hands isn’t an enviable position. But Hrothgar took Ecgtheow in. On the other hand, Ecgtheow helped Hrothgar, though it seems that this help was much less explicit. Yet, I think that Hrothgar is well aware of both of these and so he feels desperation because only might (something Hrothgar lacks) can deal with Grendel and a sense of obligation to Ecgtheow’s kin. Hrothgar’s feeling this way explains his shift into a more open style of conversation. Going further, I think that Hrothgar mentions the oaths that Ecgtheow swore to him to confirm to Beowulf his father’s honorability and to inspire in our hero a sense of filial obligation. Beowulf did not take such oaths. Nor can he be expected to at this point in his relationship with Hrothgar. Yet, Hrothgar would certainly have been aware of Beowulf’s understanding of the importance of words after hearing his pitch. Thus, he likely mentioned his father’s oaths in a calculated move to appeal to Beowulf’s underlying philosophy of following through on his word. So Hrothgar’s jumping to much more open speech (though it’s still not free from his use of words like “ðu”) fits into the poem’s current situation. This shift is also, of course, a convenient way to pick up the story’s pace. Hrothgar’s speech is much less colourful than Beowulf’s. He doesn’t use nearly as many words that could be interpreted in more than one way, nor does he use that many compound words. Though of those that he does use, the curious “hordburh” and “gesloh,” an example of how much the prefix “ge” can change a word, are worth pointing out. Now, fierce as the Danish people that Hrothgar rules over are, and as likely as they are to live in towns filled with plunder, “treasure city” just doesn’t have enough of a ring to it for my tastes. So I got a little creative and instead rendered “hordburh” as “walled and treasure-filled towns.” It’s a bit wordy, but I think it works. Modern English just doesn’t compound like its ancestor. This prefixed verb means “to enter into by fighting.” It’s pretty straightforward in context, and I’ve kept it nearly as it is in the passage above. But what happens when you take “ge” away? The word “sloh” is a form of “slean,” which can mean “strike,” “beat,” “stamp,” “coin (money),” or “forge (weapons)” in one sense, “throw,” “cast,” “sting,” or “pitch,” in another, “strike across,” “dash,” “break,” “rush,” or “come quickly” and “slay,” or “kill” in yet another. It’s a single word that covers a lot of ground. Yet with “ge” added to it, it becomes quite narrowly focused. Though, in the first sense of “slean” there’s some of “geslean” to be seen. For that first group of words relates to creation in some form or another (as long as you understand “strike” and “beat” as referring to hitting instruments or mixing things. Building on this relationship, I think that you can draw a connection between the first sense of an un-prefixed word and its prefixed form. The latter may also bring in some of the former’s other senses. These “ge-” words are sort of the opposite of the words that I’ve been tracking over the last few weeks because of their specificity, but they’re just too odd to pass up. There really isn’t anything like the “ge” prefix in Modern English. Just another reason to study these old books. Next week Hrothgar continues to speak, telling Beowulf that his thanes are thinning out. As for this week’s excerpt: What do you make of Hrothgar’s switching tones? Do you think that he’s come to trust Beowulf based on his family connections and speech alone? What about this week’s words, “is walled, treasure-filled town” a good translation of “hordburh”? This entry was posted in poetry, translation and tagged Anglo-Saxon, Beowulf, Grendel, Hrothgar, Old English, words by NSCZach. Bookmark the permalink.